The centuries old ice coming down the slopes of Öræfajökull via Svínafellsjökull glacier has had almost all of the air pressed out of the ice. Once air has been pressed out the ice turns into this magically blue crystal like ice. The outer surface of this ice (the surface of the glacier) gets bombarded by weather, sun-rays, dust and other things and it transforms the crystal blue ice white. Hidden under the white surface is the blue ice. This blue ice can be seen however under certain circumstances. It can be seen in winter after long periods of rain when the surface layer of the glacier has been washed away. It can be seen in ice-caves like this one (unsafe in summer) and on floating icebergs that have recently rolled over. 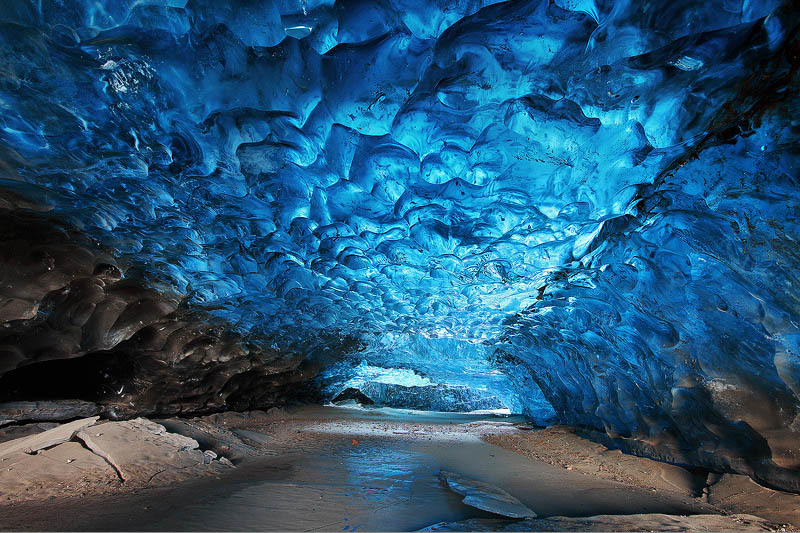 This ice cave is on the edge of the glacier where it enters into a lagoon. It is only possible to access it when the lagoon is frozen. Ice caves are in general unstable things and can collapse at any time. They are however much more stable in winter when the cold temperatures harden the ice. Even so we could hear constant cracking sounds inside the cave. It was not because it was going to collapse but because the cave was moving along with the glacier itself. Each time the glacier moved a millimeter loud sounds could be heard.